The HI-991404 combines 4 meters into one easy to use wall mounting continuous indicator. 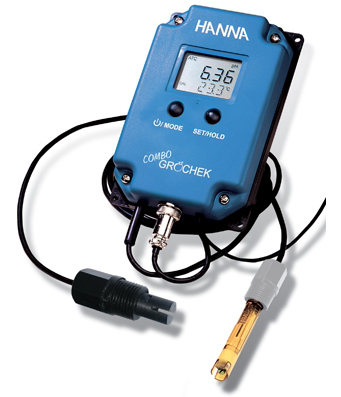 Featuring a large, dual-level, back-lit LCD display the meter can display the temperature of your solution together with the choice of either conductivity, pH or total dissolved solids (TDS). It also features a reading stability indicator and a hold feature to make it easier to write down a particular reading. Calibration and temperature compensation is automatic, while the conductivity and TDS conversion factors and temperature coefficients are user adjustable for specific application requirements. Supplied complete with a non-clog double junction pH electrode and a rugged conductivity/TDS sensor, 12volt power transformer and buffer solutions 4 and 7 together with conductivity calibration solution. For the full prodcut specification please see the attached instruction manual.